My last blog post probably made it sound like the Susitna 100 is the most dreary race in the world and I'm training for it in the most dreary way possible. The truth is, I don't believe that in the least. The only reason I race is so I have a valid — or at least good — excuse to train, all the time. A couple of weeks ago, I read an article in Time Magazine about a scientist who is working to develop a pill that gives mammals all the benefits of exercise without actually having to go to the trouble of exercising. I asked myself if I would take such a pill, and decided with confidence that I would not. In all honesty, the supposed benefits of exercise fall far behind the simple fun of pursuing an active-adventure lifestyle. I mean, really, how many adults have an "excuse" to strap a 20-pound sled to their hips and press into blinding white-out with illusions of Shackleton and South Pole exploration swirling through their endorphin-buzzed imaginations, and not be labeled as crazy? I was busy all day Friday with work obligations, so there was only time to squeeze in an 80-minute run up the south summit of Sentinel at sunset. Missoula has been mired in a prolonged January thaw, which completely decimated the snowpack. Most of our run to 5,100 feet elevation was on mud and ice-crusted dirt. The temperature was 43 degrees. It wasn't California warm, but it wasn't Montana cold. 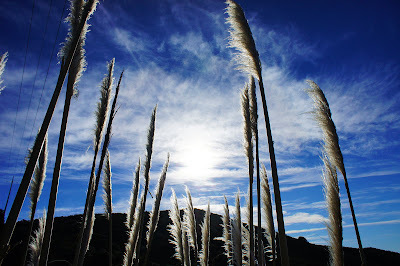 It was this strange, in between place that made me think a lot about spring. It didn't help that it looked like early spring, with warm light reflecting off snowy peaks that seemed impossibly far away. On Saturday we wanted to do a test run with our sleds, so we had to go looking for snow. Lolo Pass crosses the Montana-Idaho border along the Bitterroot Divide, and is notorious for capturing snow. It's only an hour away from Missoula and yet I've never been there, another sign that I don't really travel locally in Montana. We eschewed the popular cross-country ski trails for a nearby Forest Service Road with what turned out to be minimal snowmobile traffic. The "run" was amazingly difficult for me. The surface was soft and we were climbing at a rate of about 500 feet a mile. With every step my quads and hip flexers burned, like I was doing an endless series of squats, or walking through deep sand with weights attached to each ankle. Despite warnings that Lolo Pass would be crawling with snowmobiles, we were the only ones who had cut tracks in the trail since the storm, and only saw one group of snowmobilers in the entire four hours we were out, right near the end. The road cut through several clear-cut areas. The thick fog and blowing snow created a bewilderingly blank moonscape. When I wasn't grumbling to myself about my wimpy muscles or obsessing about pizza and coffee, I lived out my Shackleton dreams. On Sunday, the snow found us. 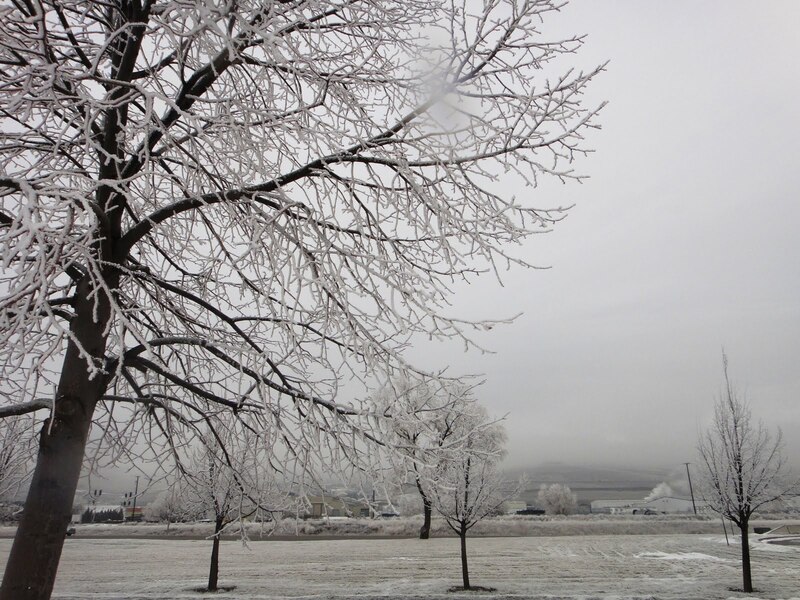 A blizzard hit the Missoula area, turning our nice brown lawns and dirt-covered trails into new sheets of white. We waited around all morning in hopes the weather would clear up. When it didn't, we reluctantly left the house at 2:30 p.m. for our favorite Sentinel Loop. 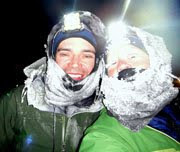 The first two miles felt downright dire, with heavy snow blowing right in our face and constant stops to adjust gear as the subzero windchill needled into our clothing. I'm getting pretty close to zeroing in on what I'm going to wear in the Susitna 100 — weather dependent, of course — but it's pretty light given what I'm used to (on a bicycle, I feel a need to wear a lot more layers.) Today it was just a light polyester shirt, a light Gortex shell, a single pair of windstopper tights, a fleece balaclava, fleece gloves, a polypro liner sock, a wool sock, hiking gaters, and Gortex running shoes. The storm cleared up ever so briefly and a few suckerholes appeared, giving much cause for celebration. The trail surface was really slippery, with fresh power on top of a solid sheet of glare ice. Beat proclaimed his micro-spikes to be his favorite piece of winter gear, though with my too-light fleece gloves I was greedily eyeing the mitten shells dangling from his wrists. Top of Mount Sentinel, trying to choke down food before the chill really set in. In this kind of "training," miles count for very little. It's all about gauging conditions, making good choices, staying warm and fed, and when all of that has been completed, maybe marginally increasing fitness. We ran 13.5 miles in just under four hours, which is only a little bit less time than it took me to run a full hilly trail marathon last week in the Pacifica 50K. Today's run was harder, and more satisfying. I love training. This has become a weekday routine for me, the Rattlesnake Corridor, dragging a heavy sled that sounds like a far-away airplane as it grinds over the icy snow, punching footprints in the soft slush until my legs sink to my knees and I can hardly move anymore. This forced stopping point always happens at nearly the same distance, 5.5 miles. I leave at 5:30 p.m. under the last gray streaks of what feels like hard-earned January daylight, which fades imperceptibly to dark gray and then black above the thick tree canopy. At first I can run "fast" at nearly 6 mph but as the trail deteriorates I "run harder" for a quad-and-hamstring-burning 3.5 or 4 mph, and then, as most trail use fades, finally a full-calf-and-ankle-shredding-1.5 mph slog. It is the most tedious three-hour workout I have ever done. There is nothing to see but a dim circle of white light on the punchy snow, or the dull orange glow of distant city lights against the clouds. 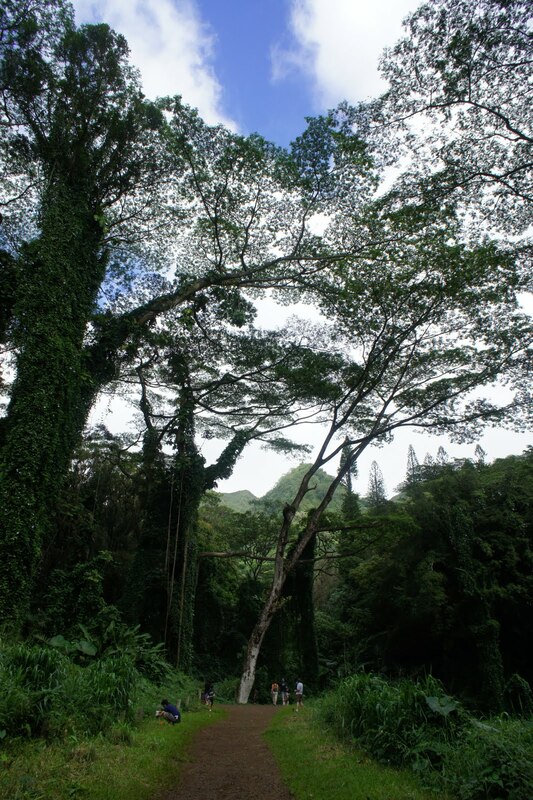 The narrow canyon and thick trees choke the landscape in two-dimensional shadows. The drag of my sled drowns out the otherwise eerie silence. Sometimes I fantasize about more engaging workouts I have done, like running on a treadmill at my old Juneau gym while Fox News blared on the television screen. But most of the time my mind succumbs to the numbness of complete boredom. The Corridor follows a gradual incline up the canyon, but the trail conditions are so difficult that I might as well put the effort into climbing a mountain. Unlike a mountain, there is no reward at the end of the Corridor, only a point where I have to stop because I can't move anymore. 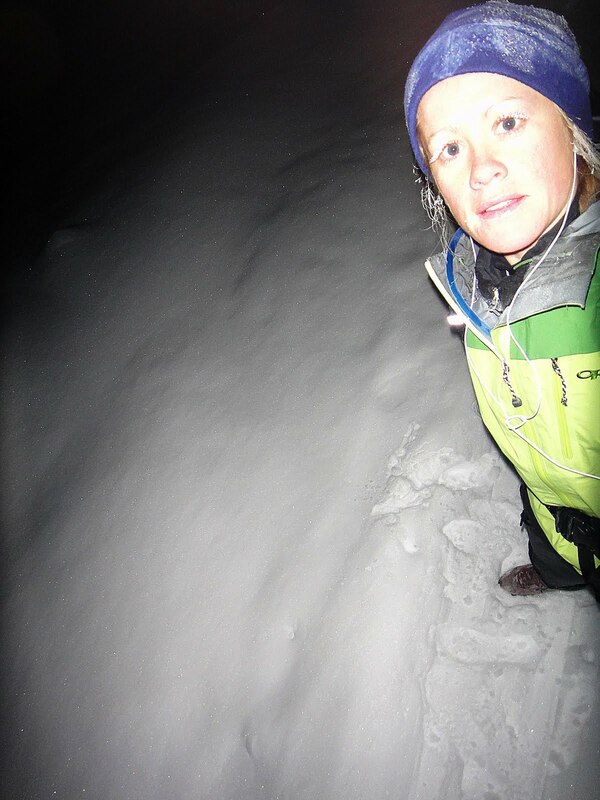 I turn off my headlamp and squint into the night — only the faint outline of mountains, trees, and more shadows. Then I turn around, and it takes the same amount of time to run back, even though it's downhill. I detest the Corridor workout, dread it, and yet I go back. Why? There is much about the Susitna 100 that I can't train for, but there is one area where I truly believe preparedness counts the most — the mental game. I have my reasons why I believe running the Susitna 100 will be a truly rewarding experience, even though I don't know yet what those rewards will entail. But there's one thing I know for sure — the Susitna 100 is going to be tedious. Amazingly, mind-numbingly tedious. I look forward to the physical challenge, the beauty of Alaska and sharing such a deep emotional experience with my boyfriend and friends. But I know at some point it's going to be 3 a.m. or 7 a.m. or 8 p.m. and I'm going to be shuffling along the Yentna River, breathing through the thick frost crusted through my face mask. All I will hear is the infernal grinding of my sled, and all I will see is the faint island of light from my headlamp, the muted gray slate of the frozen river and the two-dimensional shadows of trees along a too-far-distant horizon. And when that time comes, I'm going to be ready. My mind will shift back to these training runs — the wet, cold feet and knee-deep slush — and I'll say to myself, "At least I'm not in the Corridor." "Wait, the race is on Sunday?" I asked. "Yeah, it says right here. Sunday. Good thing I checked," Beat answered. "Huh," I said. "So what are we going to do on Saturday?" I had returned to California for yet another warm January weekend. It wasn't that I was avoiding Montana's winter, it's just that Beat had a really busy month at work, and it meant I had to briefly switch places with him on the frequent flyer airport circuit. I do a lot of my blog reading at MSO these days. I have become a connoisseur of the different varieties of packaged sushi at Sea-Tac. I breeze through Salt Lake City International more often than I'm willing to admit to my close-by family. I'm starting to understand just how hard Beat has been working for the past three months. It's a strange, sort of detached existence where I fall asleep in a white and gray night and wake up to a moist green morning. And on Saturday, the first thing I noticed was Beat's mountain bike. Is there anywhere around here to ride?" "A few places," Beat said. We walked to a bike shop and purchased a mountain bike map, and decided on the trail system around Black Mountain, which is within running - and therefore pedaling - distance from Beat's apartment. He rode his old steel rigid mountain bike and let me ride the Santa Cruz Blur, a smooth and light beauty of a bicycle. As we pedaled into the bright light of early afternoon, it occurred to me that it was already January 22, and this was my first non-commuting bike ride of the new year. In fact, if I added up my total riding miles for 2011 to that point, the number probably wouldn't have surpassed 50. A flush of shame filled my cheeks when I thought about my own neglected bikes back home. I become so one-track-minded when I get a goal in my head. Susitna, Susitna, Susitna. And, of course, there's the importance of spending as much time as I can with Beat, and the travel necessary to do that, and working, and other life stuff. The all-encompassing schedule doesn't even carve out a handful of strung-together moments for joy-riding. But then this race we had entered wasn't happening until Sunday. We climbed nearly 3,000 feet on a narrow, low-traffic strip of pavement, with sunlight shimmering and vineyard leaves rustling in the wind. The temperature was in the high 60s when we hit gravel. The crunchy sound of wheels on dirt was almost strange, so different from the squeak of cold snow or crackle of studs on ice. We started downhill in a rush of warm wind. I couldn't help but giggle out loud. We climbed and descended again, spinning easy on the smooth double-track, before descending a narrow, winding road on the other side of the mountain. I was nearly beside myself with glee, just to experience again what it was really like to ride a bicycle in the summertime, when the living is easy and the miles are effortless. Twenty-four miles and 3,200 feet of climbing fell away all too soon. I wanted to keep riding, to spin my overworked and undertrained bike muscles into the long, warm night ... but we had that race on Sunday. Sunday morning came painfully at 5:30 a.m. True to his Swiss heritage, Beat likes to arrive at events early, which is a good balance to my "10 minutes late is practically on time" Utah upbringing. But mornings never agree with me, and I could not wake up. 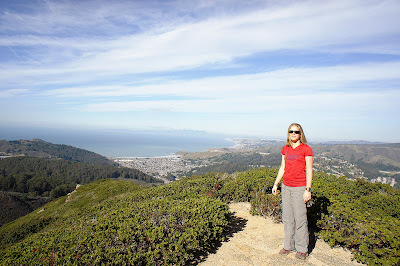 We drove to Pacifica, and for the first time in California I noticed the morning wasn't foggy - it was clear. That didn't bode well for the heat factor later in the day. Beat walked around greeting his friends and I slumped in the passenger's seat of the car, trying to stay awake and cranking the volume on my iPod ... listening to "Sleepdriving" by Grand Archives ... Swirling round, the light above .. Outside the crows were waking up ... It's nearly dawn ... Motel home was nearly gone ... No sleep at all. Pacifica was a large race - more than 250 people lined up for the 21K, 30K and 50K races. 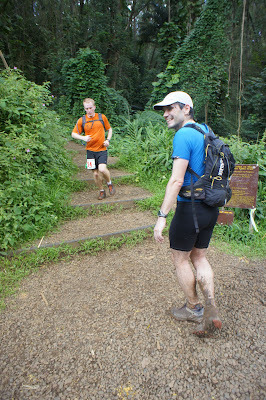 Beat and I were registered in the 50K, despite the fact he just finished the grueling HURT 100 a mere week before. It was to be my third 50K ever, and also my third 50K in just over a month. Since when did I become the kind of person who ran three 50Ks in a month? I would have never foreseen it a year ago. Then again, I wouldn't have foreseen much of what my life has become. This is a good thing. I have always found my greatest rewards hidden far outside my comfort zone. 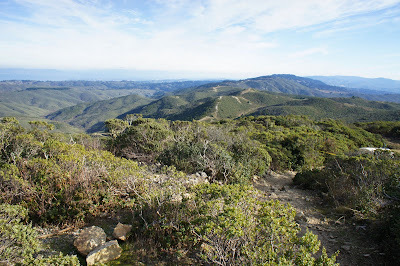 We joined the bottlenecked-hoards on the singletrack of North Peak Montara Mountain, starting what was to be our mere first 1,800-foot climb of the day. The Pacifica 50K - with 7,500 feet of climbing and descending on technical, exposed-to-the-elements trails - has the reputation of being one of the more difficult ultramarathons in the Bay Area, and thus attracts a large number of people. As we neared the top, we were passed by the leaders on their way down. Among them, already a mile ahead of me, was a super-fit woman with biceps the size of my quads and a fierce look on her face. "I don't think you're going to win this one," Beat said. "You think?" I laughed. As it was, I doubted in my ability to even make the race cut-off, which the day before had been bumped from nine hours to eight hours due to early park closure. I was worried about the technical downhill and my physical reactions to it. Not to mention this 50K wasn't worth jeopardizing anything about Susitna ("Susitna, Susitna, Susitna") which is less than a month away. So I was going to be careful, and I wasn't going to push any boundaries, but I was going to see what I could do. In an effort to combat my side-stitch issues, I took two Advil before we started our first descent. 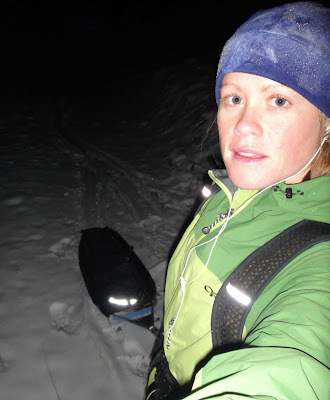 Although I felt a bit of mid-section cramping, it seemed to hold back, and allowed me more freedom to lengthen my stride and try to eat up some hard-earned miles. At one point I passed Beat waving my arms in the air and yelling "Eeeeeeek" because I was only just barely in control. I was having a great time. We started up the second and third climbs just as the day really began to heat up. I sucked down water like they were giving it away for free, which they were. The double-loop nature of the race placed an aid station after every 7 miles or so, and despite my 70-ounce bladder, I was refilling on a regular basis. I had a few annoying issues. My angry knee flared up much as it had on New Year's Eve - I instantly blamed the Black Mountain bike ride the day before, probably unfairly - and the low-level side cramping continued. But for the most part, I felt good. I really enjoyed the downhill running, and thought the climbing was easy because, well, I power-walk climbs. But I know I have little to gain by running uphill. It's the difference between a 14-minute mile and a 16-minute mile for me, and the effort to run the steeper uphills would blow me up before I ever finished 50 kilometers. But the 4 mph walking can carry me 100 miles or more if I want it to, at least in theory. There was lots more climbing. The sun burned hot and high. A lot of the people who had originally signed up for the 50K decided to stop at 30K, telling the race directors that "they didn't want to go back up there." "There" was North Peak, a second time. 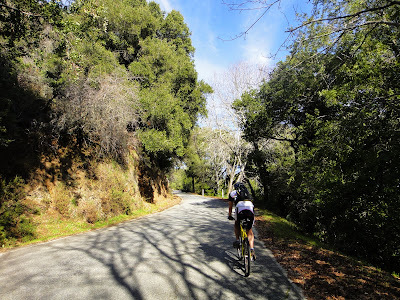 1,800 continuous feet of climbing, again. The high temperature was 76 in the town of Pacifica, which is right on the coast. Where we were, in the heat-trapping oven of the canyon, at higher elevations, it was easily in the 80s. We passed runners whitewashed in their own dried sweat. The mostly clear sky burned almost white. The ocean shimmered a dark blue to the west, while to the east the San Francisco Bay was a bright aqua-green. The marine scenery was gorgeous and I was really annoyed that my early-morning haze had caused me to forget my camera. I was so annoyed with myself that even though Beat let me borrow his Droid, I still didn't take any pictures. But it was beautiful. You'll just have to take my word for it. Beat teased me because I was wearing tights. "Which tights are you wearing?" he asked me. "My running tights," I answered. "The ones from REI." Beat laughed. "You wear only those at 0 degrees and you still wear them when it's 80 degrees." I smiled. "They have a wide range. They're good tights. Anyway, they're the only piece of running clothing that I own." Despite the heat, and my non-acclimatization to it, I didn't feel too bad. I took two more Advil to hold off the cramping a bit longer. I massaged my angry knee as we climbed to work out the pressure. And I flailed the downhills, taking purposely careful steps but waving my arms carelessly because the downhill running was too fun to take too seriously. 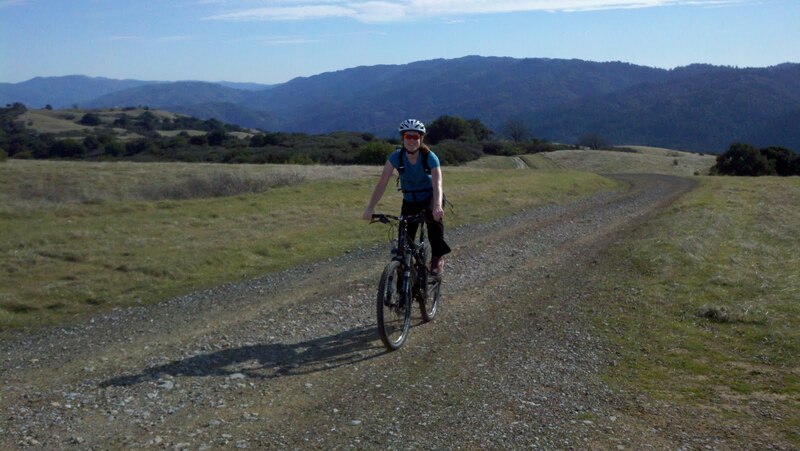 It was hard and strenuous, unlike the effortless joy of a freewheeling bicycle, but it was fun all the same. I was really glad I had decided to race the Pacifica 50K. This past month has held large glut of races for a newbie like me. But I like Beat's strategy of using "short" races as training runs. Even at a slower endurance pace, racing still challenges me to push myself harder than I otherwise might. I have not yet been disappointed in the results. If you have a big goal and a short period of time to get there, pushing your limits is the only way to go. We ran to the finish at 6 hours and 38 minutes, easily making the eight-hour cutoff that I had been so nervous about. 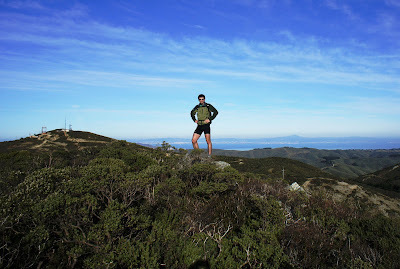 The Pacifica 50K was my hardest race yet, and I also think it was my best performance of the three. I was able to catch my small issues before they became big ones, and gain yet more confidence in the ability of my feet to carry me for long periods of time. My Garmin stats are here. The race results are here. Beat and I were 33rd and 34th overall. I wasn't even close to the first woman this time around. But I will point out that I stuck it out while a fair number of people opted out at 30K. 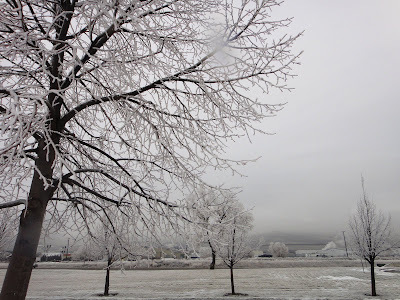 Then, when I returned to Montana on Monday, the air was refreshingly frosty. This was my last trip south for a while. But that's OK. It's kinda pretty here in the north. 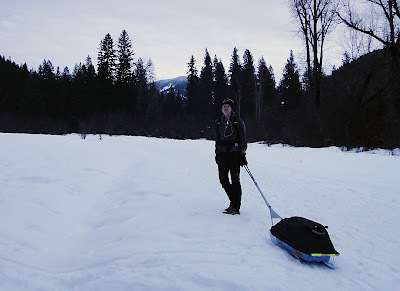 Lately, during my evening runs in Montana (and yes, I do still occasionally run in Montana), I have been dragging a sled along for the trip. The sled is a harsh necessity of the Susitna 100, which requires every competitor to carry at least 15 pounds of survival gear, including a sleeping bag rated to -20 degrees F (mine is rated to -40), a bivy sack, a closed-cell foam pad, 3,000 calories of emergency-only food (i.e. you're not allowed to eat it), a stove, a pan, fuel, and whatever else you feel like bringing. This is my sixth year preparing for a winter ultra in Alaska, but my first attempt to compete on foot (all the others have been by bicycle.) I have mixed feelings about the Susitna 100's required gear. I understand the harshness of the environment and that the race directors have liabilities. However, I also feel that people who are bold enough to sign up for a race like the Susitna 100 should be smart enough to know what they need. The White Mountains 100 takes place in a much more remote region, under generally colder conditions. But in that race, competitors are allowed to choose what they carry. There is no required gear. In last year's White Mountains 100, I opted to carry an emergency bivy system — a down coat, a light down sleeping bag, bivy and pad — reasoning that it would at least keep me alive for a few hours if I somehow became completely immobile, but wouldn't allow for any sleep on the trail. 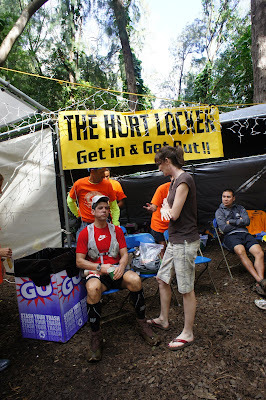 Other racers in the WM100 opted to carry only a few extra items of clothing and food, and no emergency bivy gear. There is inherent risk to that, but in a controlled environment like a race, it's less risky than embarking on a long day hike in the winter without full bivy gear, which I do all the time. I wish the Susitna 100 organizers would allow racers the same freedom. Although I am venturing into unknown territory this year — a potentially very long foot race with higher likelihood for injury — so I might still opt to carry everything they require anyway. But yes, the sled. 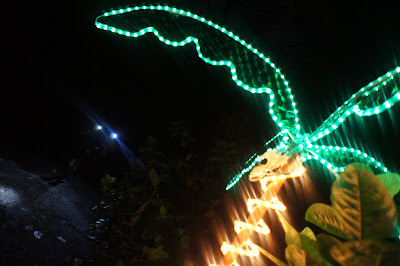 In my testing so far, I have been very happy with its features and construction. Geoff developed it over three years, tweaking the harness, ski mounts and cover, so it's really dialed in. He wrote a blog post in 2008 further describing the sled, or at least Version 2.0 (Anatomy of a Sled.) Since then, he added a custom-designed cover, improved the harness substantially and attached it to the poles with industrial silicone that's rated to 100 below. A rope threads through the poles and wraps around the sled, so it's both strong and flexible. The rigid poles also prevent the sled from getting away from you on the downhills. I have run down some very steep slopes and it stays exactly where I want it to. It also tracks very well. Last night I did an 8-mile run in Blue Mountain — largely on winding, uneven singletrack — and it stayed directly behind me around every narrow curve and steep sideslope. The skis seem to reduce drag substantially, and the sled itself will still float on top of deep powder. The harness also is quite comfortable, outfitted with several loops should any fail. On steep uphills, the weight pulls fiercely on my hamstrings, so I need to work on strengthening those. Luckily, there aren't many uphills in the Susitna 100. Eric Parsons at Revelate Designs custom-designed the cover in 2009, and like all of the bike gear Eric builds, it is a marvel of Alaska innovation. 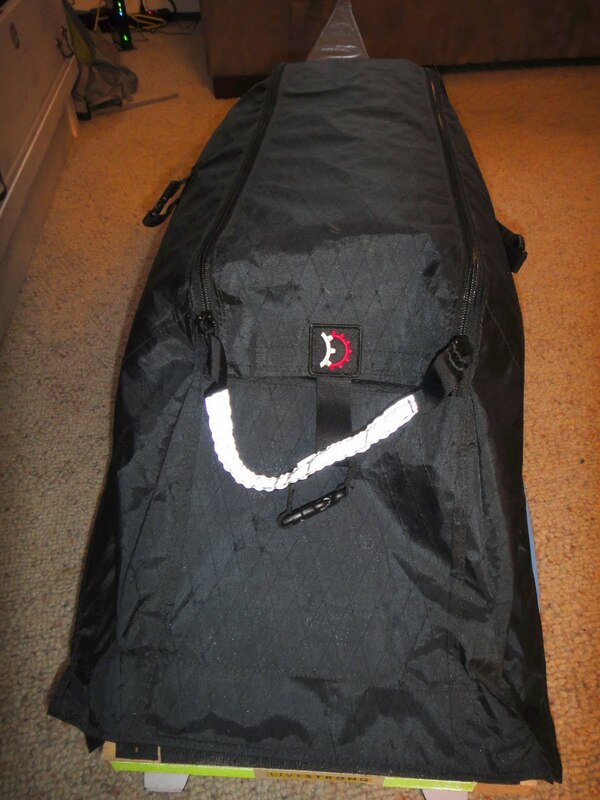 It attaches to the sled with very strong velcro, and has a three-quarter length zipper that zips both ways. When I stuff my sleeping system in the center, I have large compartments in both the front and back for easy accessibility to my food and gear. The cover is waterproof and prevents any snow from creeping into the sled, which will minimize the dead weight I have to drag for 100 miles. The cover is strong, too. Last night I rounded a sharp hairpin turn and tipped the sled over. I actually didn't even notice for about 100 yards; it just continued to follow me completely upside down, with no lost gear and no damage. Luckily, Eric builds his gear to be "Jill-proof." It even has reflective stripping so the snow-mos can see me. The Susitna 100 is now officially a mere month away, and fear has firmly settled in my heart. 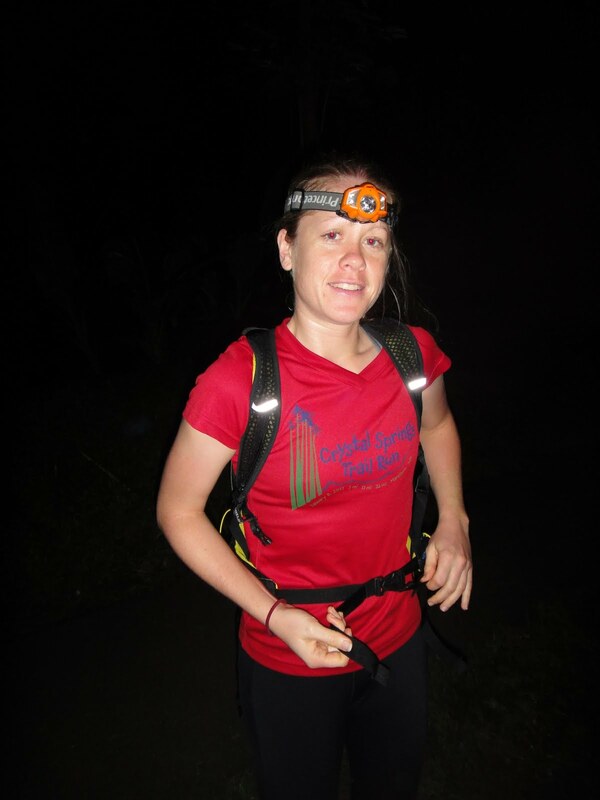 I feel confident in my ability to prepare for and deal with cold or wet weather, to keep moving for long periods of time and even to eat properly, but I am quite terrified of the physical prospect of this race: my legs, my feet, my stomach and the possibility that it could take all of 48 sleepless hours. That's why I chose to run the Susitna 100; the bike just wouldn't offer the same unknowns, the same challenges (although it would of course still be extremely challenging.) The Su100 — complete with ghostly apparitions of Flathorn Lake and the long minutes before and after I punched through the ice and froze my right foot in 2009 — are often all I think about when I'm out for my long sled runs. But on Thursday, I felt just a little more confidence creeping in. It allowed my mind to drift back to Martin Luther King Day in Waikiki, when Beat and I went on an 11-mile urban "recovery hike" from our hotel to the top of the Diamond Head crater, and the sun was so warm it made my head spin, the land so green and water so blue it was impossible to comprehend how this could exist in the same hemisphere as Alaska. Beat halted in the middle of the trail. 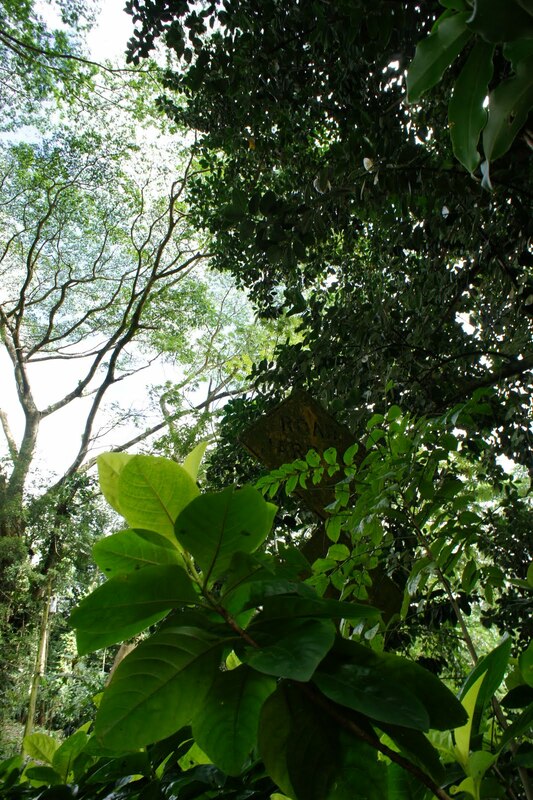 The forest was black, with the jungle canopy masking the moonlight and blotting out the starry sky. The air was as thick as hot chocolate, oozing down my lungs like warm syrup. The trail was just as sticky, coated in a thin layer of dew-saturated mud that grabbed your shoes and sent them skidding toward the dark oblivion of the forest. Beat didn't say anything. His head continued to face forward, held slightly limp by his drooping shoulders. I stood behind him and waited for a reaction. I expected him to tell me his feet were killing him or his legs were tired or he too was choking on this wretched humidity. But the silence lingered. Finally, I said, "Are you asleep?" A small cough. "Um ... no ... I don't think so." To figure out where you are, sometimes you have to go back to the beginning. 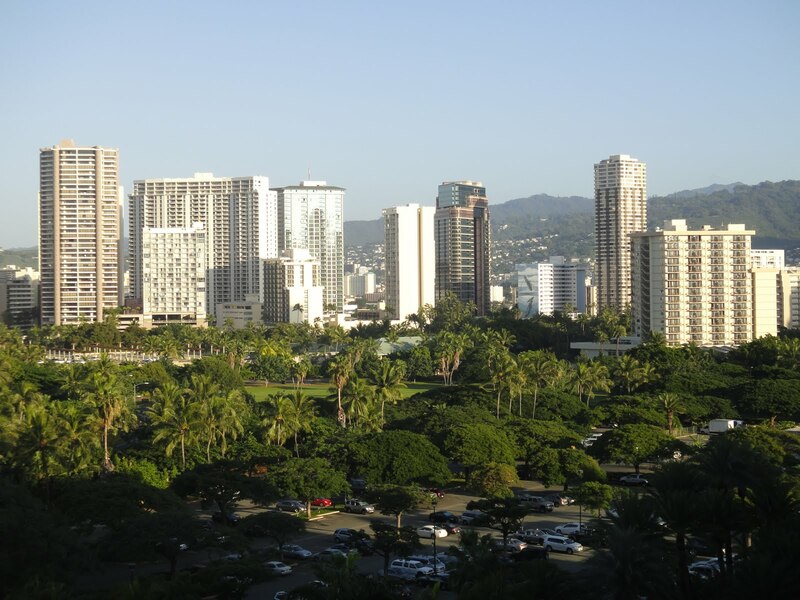 My first trip to Hawaii also came about because of the HURT 100. It was January 2009, and I was vacationing and crewing with my then-boyfriend, Geoff. Several of the people at this year's race even remembered me as the chick on the bicycle, showing up at aid stations in my bicycle shorts and and helmet, refilling gel bottles and disappearing back into the night. I wasn't such a good crew-person back then. I was more concerned with putting miles on my rented road bike as a training ride for the Iditarod Invitational. I spent the day and night pedaling around the steep hillside neighborhoods of Honolulu, and I missed more checkpoints than I made. Geoff won that race. 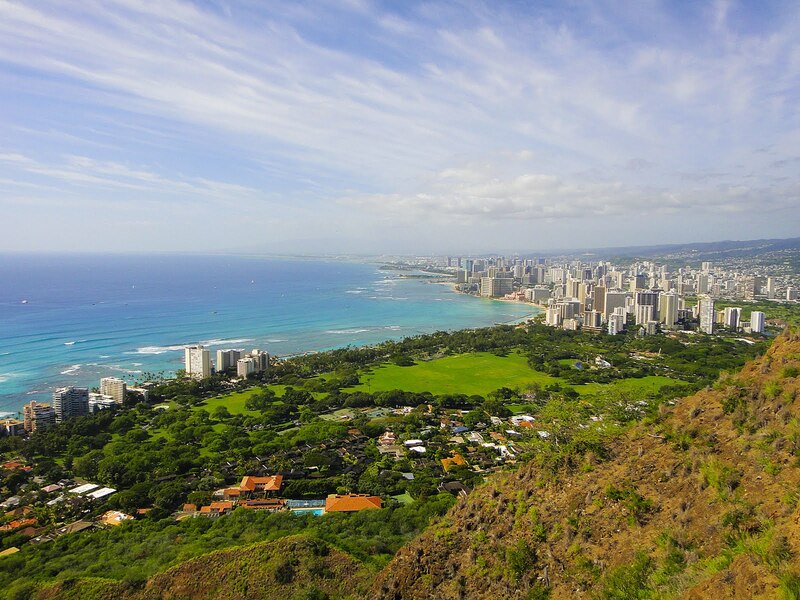 Even though he would spend the rest of the week in Hawaii firmly planted on his sleeping pad in sheer exhaustion, he didn't act too worn out at the time. I asked him what the HURT 100 was like. "Kind of like running in Juneau, but hot," he replied. And I just smiled, because I thought I understood, but I didn't have a clue. So when I returned with Beat, I had a lot of conflicting memories of this place. The crowded streets, the terrifying traffic, the checkpoints that smelled strongly of ramen and faintly of vomit, and of course the strange dynamic surrounding my role in it all. 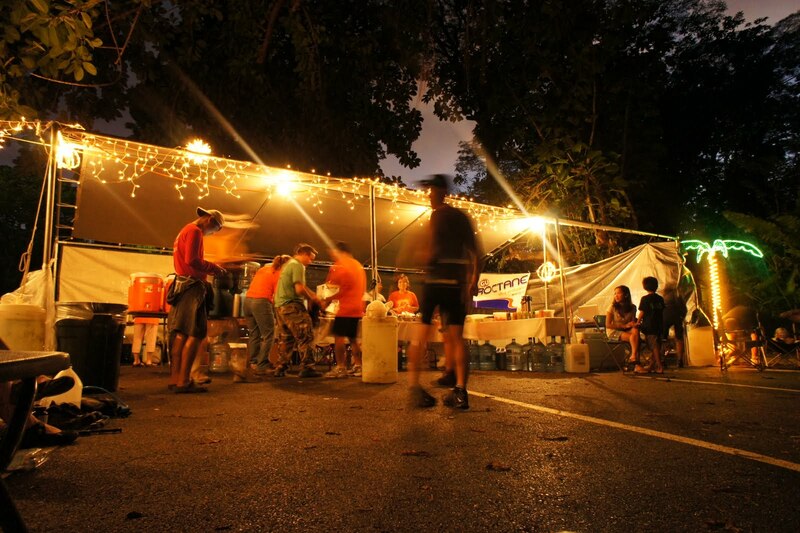 In every major ultrarunning race, there are organizers, runners, volunteers and crew. Organizers get the financial benefit, runners get the glory and volunteers get the appreciation. Only crew, the lowly masses who follow one particular runner around, are truly nobodies in a race. 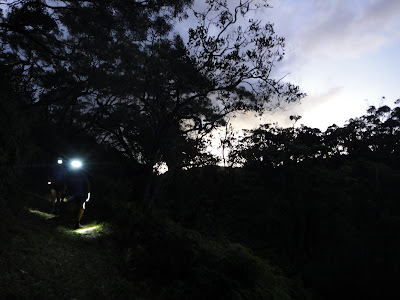 We wait in the shadows, chat quietly with the volunteers, refill a few bottles, hug our sweaty smelly runners, travel to the next checkpoint, and we wait. And wait. Nobody even notices we are there, waiting, unless perhaps we are wearing funny bike clothes. 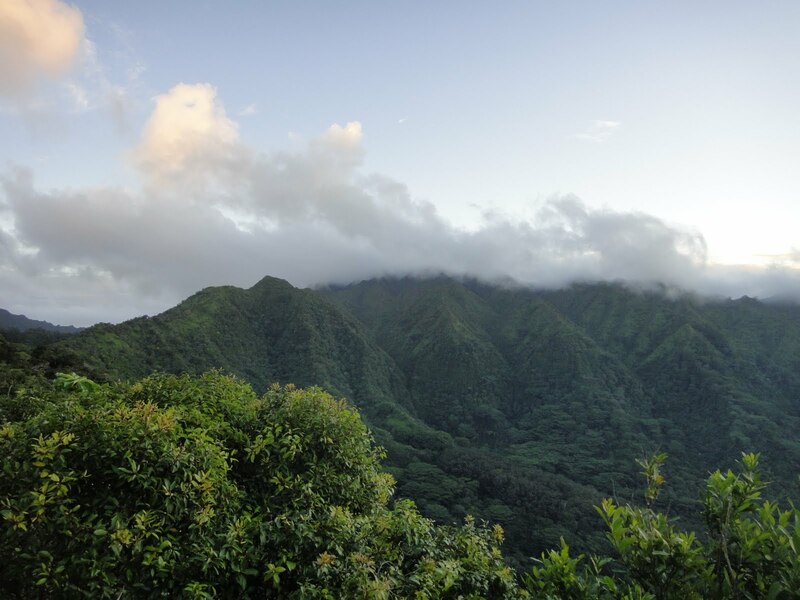 Beat and I woke up at 4 a.m. Saturday, prepped the rest of our gear, and drove to the race start at a nature center nestled beneath the green cliffs of Oahu. 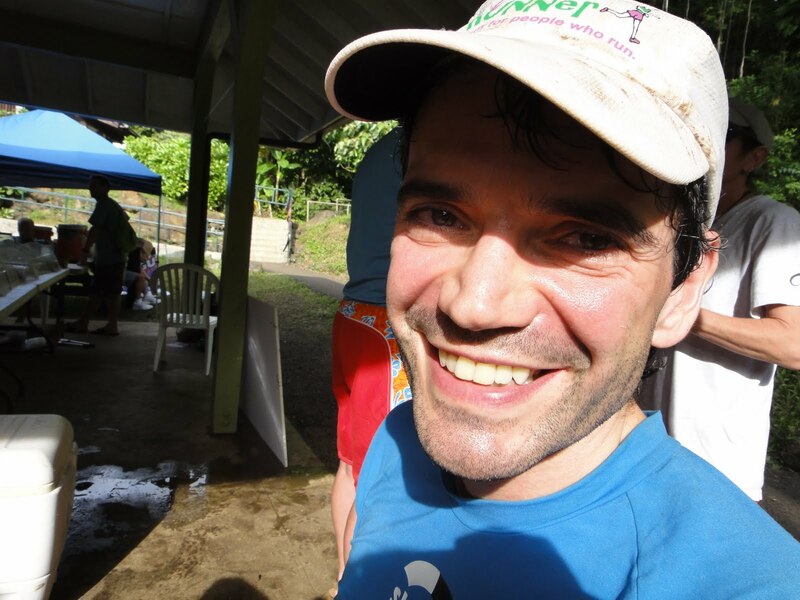 I saw him off at the 6 a.m. start and then headed back to the hotel for the first order of duty, which was to help register Beat for the 2011 Tor des Geants, since registration was likely to close later that day. Thanks to Web site difficulties this simple chore turned into a three-hour exercise in futility, complete with frantic messaging with Beat's mother in Germany. Defeated, I got back up to meet him at the end of his first 20-mile loop. He made good time on lap one, and I barely caught him as I climbed back up to the nature center. Beat didn't look too fresh as he walked toward me. His hair was drenched and his legs were covered in mud. "It's really slick out there, really hard," he said ominously. He told me of the slippery roots and rocks that added another layer of difficulty to the already steep and technical trail. His eyes were glazed with fatigue and his skin looked soft boiled. "I only have to make it to the 100K mark to get my 500-mile jacket. Maybe I can just stop there." "You can do whatever you want," I said, knowing full well that wasn't what he wanted to do. The checkpoints cycled on. There were three for each loop — Paradise at mile 7.5, Jackass Ginger at mile 13, and the start/finish at mile 20. Beat mostly didn't need my help but I tried to be there for every one. I watched him arrive struggling but leave perked up. I bonded with other anonymous crewpeople. Chris from Ontario was a brand-new runner, like me. 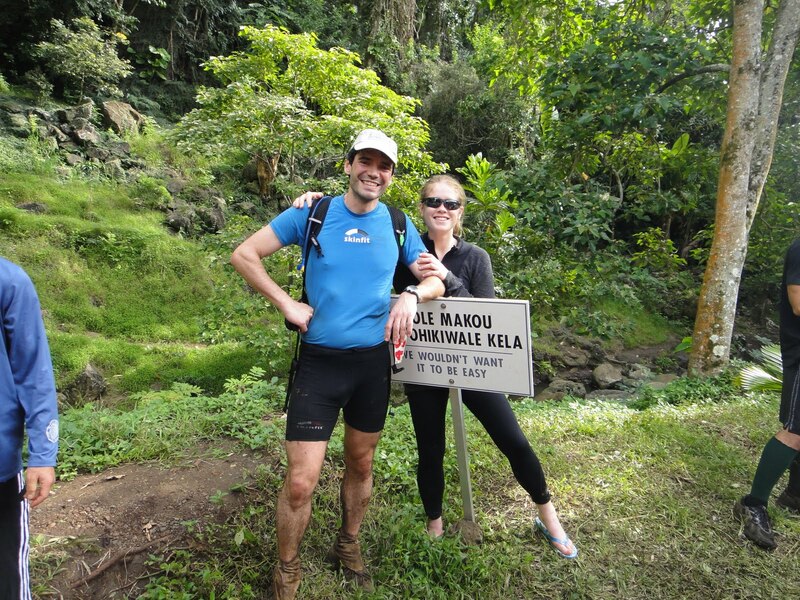 His partner, Charlotte, was a seasoned ultrarunner who competed in at least a dozen big races every year. He showed me the spreadsheet of the exact times she expected to hit each checkpoint. He said she trained very specifically and like to keep order in her running. She never seemed to be able to eat anything, though, and he still didn't know what to do about her nutritional needs. He had stopped at the store to buy Twix bars and wrapped a few hot dogs in foil for good measure. "I don't know if she'll eat any of it," he said sullenly. "But I have to at least try to get her to." I saw in Chris's eyes the kind of devotion that defines a good crewperson. The kind of person who is content to stay up all night, neglecting his own needs in order to coax calories into a grumpy runner who's aching and exhausted and is more likely to snap at him than thank him. Around 1 a.m., Beat ran into the nature center to finish lap three. 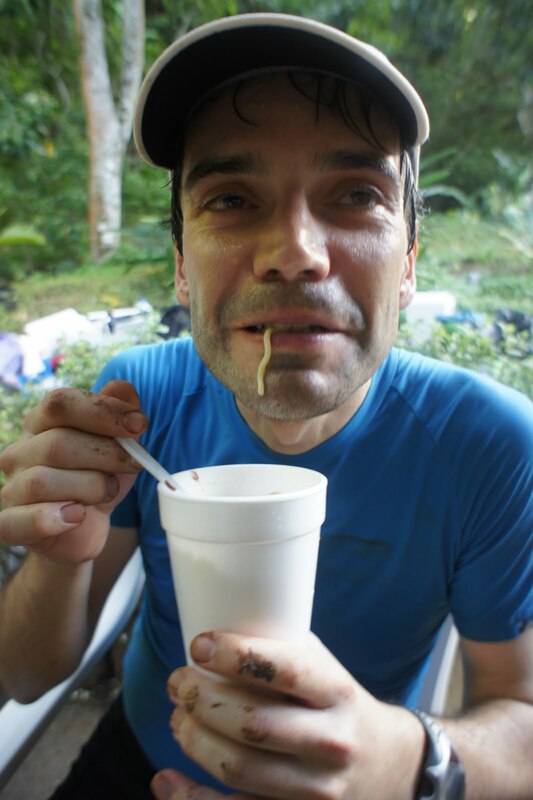 He was already at mile 60, having moved beyond fatigue into more of a shellshocked state, which made him seem unusually subdued at the checkpoint. The plan was for me to pace him for lap four, which was more for my benefit than his — he wanted me to have an adventure — but the overnight nature of the loop did give me the opportunity to serve the standard role of the pacer, which is to keep a runner company and keep them moving. If I look tired, it's because I was. It was 1 a.m. and I was about to only start running. Beat and I had a long night in front of us. We started up the trail, breathing the thick, warm air, pressing our feet into the slick trail and feeling them slide back with every labored step. 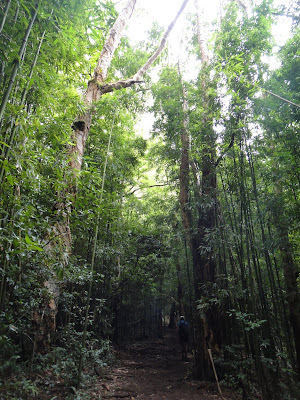 As the trail jutted skyward, there were more roots and rocks, more dark lumps to crawl over and around. 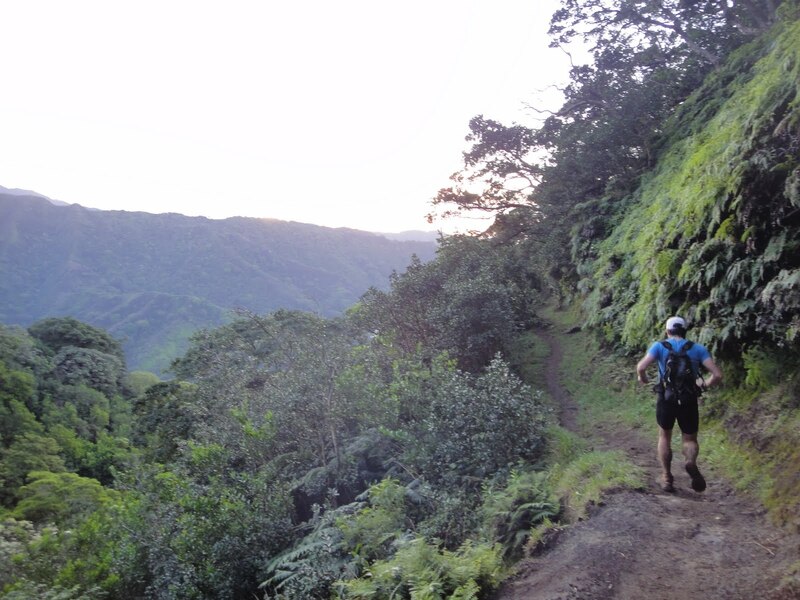 This is the true evil of the HURT 100 — it's not a posh 100-miler in Hawaii in January. It's not just 100 miles. It's 100 miles of technical singletrack, climbing and descending 25,000 feet on an seemingly endless and maddening loop, amid temperatures that northerners can scarcely deal with during the winter - 65 to 80 degrees, with 92 percent humidity. 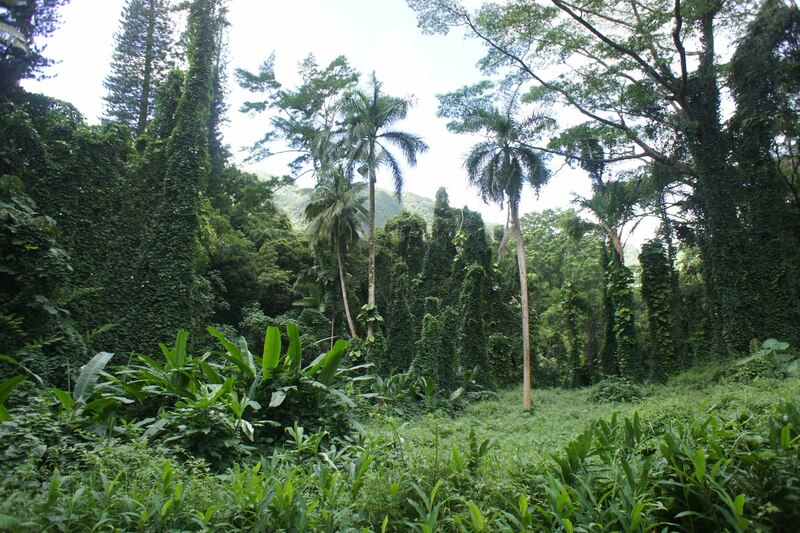 It cuts you down slowly and painfully with blisters and bruises, blood and dehydration. One might say it's the lucky ones who twist their ankles and can drop out with a clear conscience. In the end, only 28 percent of the people who started the 100-miler would finish it. Beat was not very talkative. I told him stories about hiking in Juneau — because the trail did remind me of Juneau — and tried to dream up stories from my childhood to stash away for future lulls in the conversation. But I don't think he was listening anyway. He was falling asleep on his feet, talking only about maybe stopping at the 100K mark, the next checkpoint. "You can do what you want," I said. "But I'd really love to see the whole course. Maybe think about doing this one lap with me." I figured if I could coax him to mile 80, he'd have to finish the race. The night wore on in the way ultra-nights do, in that strange, watery place between sleep and consciousness. The lights of Honolulu glimmered whenever the forest canopy opened up. Birds chirped and squawked. Unseen streams gurgled beside us. Roosters darted across the trail. Headlights bobbed in the darkness. Runners ran past saying things like "Good job" and "You're doing awesome." Other runners hunched over the trail, coughing and vomiting. We climbed and descended, slipped and slid. Even after a mere 10 miles, the technical nature of the trail was wearing on my nerves. I'm not a skilled runner just yet and I don't have the sure-footed stride of many people out there. 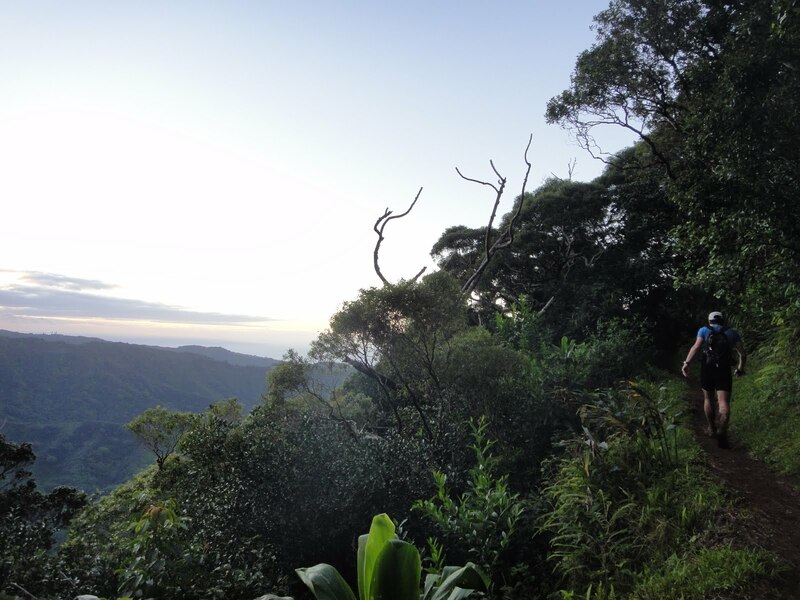 I was flailing over the rocks, clutching to ropes and sweating profusely down climbs that I had been able to breeze up. I was struggling but I knew that didn't matter. This was not my battle. This was Beat's war. I had to put my problems aside and focus on his needs. This realization was freeing. I was egoless, a crewperson, nobody. I had no place here, only a fleeting presence. A ghost in the night. The thought suddenly made me feel light on my feet. If Beat could run 80 miles on this brutal course, I could certainly run 20. And if I in any way could help him achieve this daunting goal, that was an awesome reward. The sun rose and brought with it the brilliant views that I had been missing through the night. But in a way, a strange way not like me at all, I didn't really care about the scenery. I was watching Beat, watching his feet as they shuffled along the trail, imagining his struggle and fight against the pain, silently trying to remind him much it will mean to him to finish this race despite the hardships. We reached mile 80 and I asked if I could do one last leg with him. He seemed excited about that, and it made it more than easy to ignore my aching legs and sweat-drenched skin and sleepiness. 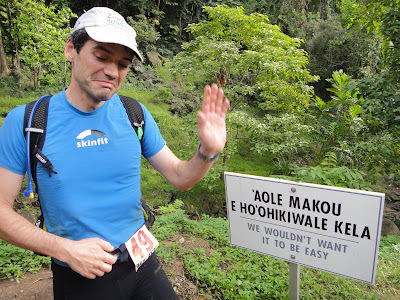 In the end I would do my own 27 miles of the HURT 100, but as an egoless crewperson it felt effortless, because it was effortless. In committing to be there for Beat, I had released myself from my own fatigue and pain. The freedom felt incredible. However, we agreed I should stop there to avoid the very real prospect of injury. I kissed Beat goodbye and took up my place next to Chris. Chris, who had been so friendly the night before, now seemed distant and angry. We drove to the final checkpoint and waited together. And waited. And as the minutes went by, I finally learned that Charlotte had been hurtful toward him. I reasoned that she was tired and in pain, that she was in a bad place, and probably wasn't acting like herself, though I didn't know her. But I also knew that Chris had been up for 36 hours too, that he too was sweaty and tired, and he had doggedly supported her during what could have easily been a fun tropical vacation instead. He should have just given up, he said, and gone home. "And yet you're still here," I said as Chris unwrapped two Egg McMuffins in preparation for Charlotte's arrival. Chris sighed. "I'm still here," he said. Behind every race is an array of stories, backroads, routes that lead us all to the here and now. I thought of my first HURT 100, back in 2009. Geoff hadn't even been unkind to me and I wasn't fully present for him. 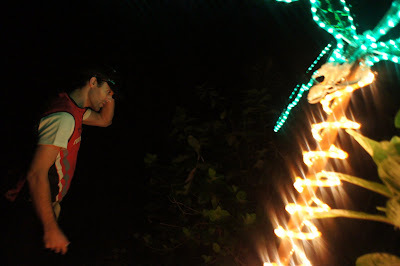 I was too concerned about riding my bike, about preparing for my big race, about myself. 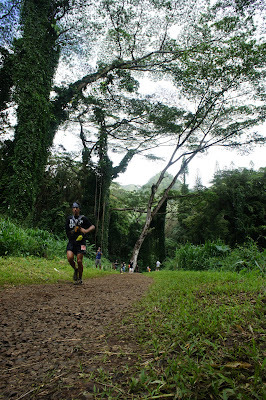 The 2011 HURT 100 was different. The atmosphere was different. The feeling was different. Maybe all I accomplished was keeping Beat from falling asleep on the trail that one time. But it felt like a monumental accomplishment. 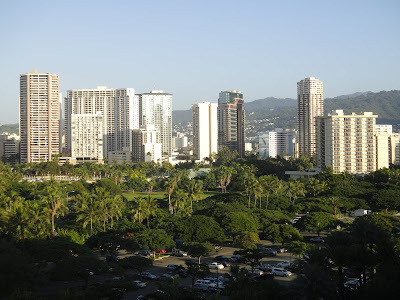 Definitely worth traveling all the way to Hawaii, staying up for 36 hours, fighting Honolulu traffic, waiting, waiting, and running for 10 hours. And when Beat strode into the finish line, after 33 hours and 31 minutes of sweating, struggling and suffering, with a huge smile on his face and a big sweaty kiss for me, I couldn't have been more proud of him. 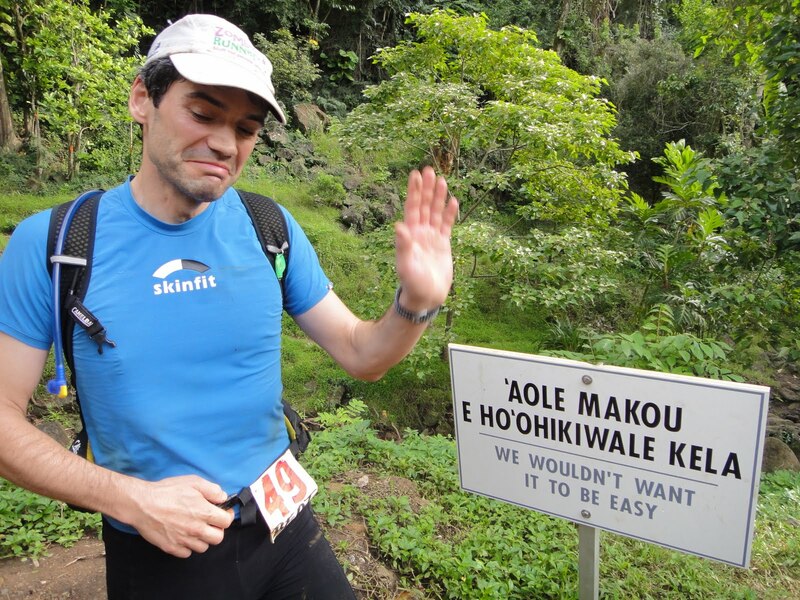 The HURT 100 stands for Hawaii Ultra Running Team, but no one who races the course thinks of the name that way. HURT hurts. 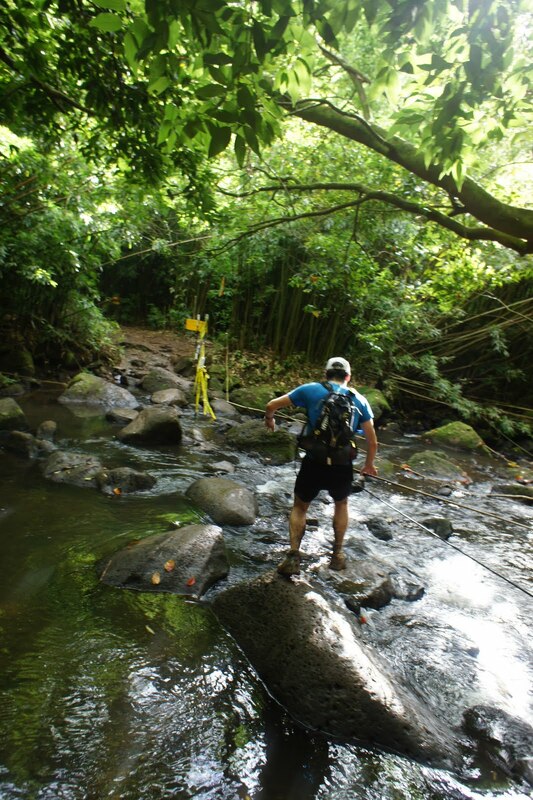 By running five laps on a 20-mile course, HURT 100 racers have to cover 100 miles and 25,000 feet of climbing on a course that is 99 percent slick, rooty, technical and steep singletrack, in temperatures in the 80s under 92-percent humidity. The HURT 100 is only in Hawaii by literal location; the bulk of the race takes place in a dank, dark place of pain and fatigue. But it is a beautiful place yet - as green as the most brilliant moments of early spring, punctuated by the chatter of birds and waterfalls, and embraced by a community of truly enjoyable people. I had the opportunity to participate in a larger spectrum of the experience this year, as a crew-person for Beat, traveling between the checkpoints, then as his overnight pacer, where I ran 27 miles of this brutal course with him between 1 a.m. and 10 a.m. Sunday. I'll write more about the experience later, but for now I have a bit of time to post pictures. Beat logged his fifth HURT 100 finish and earned his coveted 500-mile jacket in a tougher-than-usual year for this tough race. The finishing rate was only 28 percent. Beat finished 13th out of 120 or so starters. After a hellishly slick descent over rock jumbles and steep, root-clogged trail, you end up in this place called Paradise. Mile 40. "I don't really have to go back out there, do I?" The unwelcome sign at Jackass Ginger aid station. 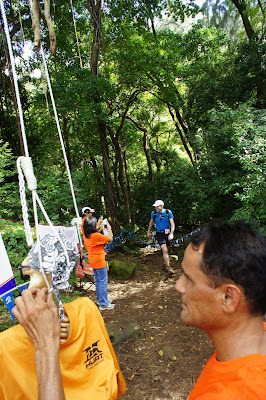 Beat makes his way up to the aid station as volunteers hang the HURT mascot above the trail. Stream crossing that must be made a total of 10 times. A party at Paradise. Aid stations quickly become a tight-knit community. Beat and his Mile 40-60 pacer - a 16-year-old aspiring ultrarunner and high school student in Honolulu - approach Paradise after sunset. Morning finally comes after a long, long night on the trail. The bamboo dungeon of Manoa Flats. At 33 hours and 31 minutes, Beat finished in 13th place after 100 miles on slick, technical singletrack with 25,000 feet of climbing. His first words: "It ain't no thang." My foot plunged deep into the dense snow and sunk to my knees. I lifted my leg up and punched in the next, groping for some kind of platform on the weak trail. Frustration crept around the edges of my mired body. I let out a sigh, thick with condensation in the cold air, and looked at the valley ahead. The Rattlesnake Mountains rose like tree-studded fortresses above the narrow canyon. The moonlight cast a bright glow on the snow, infusing the corridor with a depth and texture that was different — but in a way, more brilliant — than daylight. I turned off my headlamp and took a few more heavy steps. Behind me, my sled floated easy and free on top of the crust — a crust I had mistakenly thought would be strong enough to hold me. Every so often I glanced back to make sure the sled was still upright. It followed me like a faithful pet, its pole wagging like a tail against the tug of my harness. I couldn’t help but laugh, and feel a strange sort of affection for my sled. It held everything I needed to survive out here, here on the edge of the Rattlesnake Wilderness, where a mere five miles of foot travel had taken me out of the city and into the heart of a silent, lonely, wild place. I had a mask to shield my face from cold wind, already near zero degrees and dropping. I had mittens to bring my tingling fingers back to life. I had food to stoke the inner furnace, water in an insulated pouch, and a sleeping bag and pad to rest when I became tired. Stars splattered the narrow strip of sky overhead. The orange glow of Missoula’s lights had faded. We were alone, my sled and me, ready to take on this winter wilderness. But we were missing one crucial piece of gear — snowshoes. Plus, I reminded myself, this was just a training run. And I was clearly not running. Reluctantly, I flipped a wide U-turn and headed back the way I came. The next evening, I went for a run straight from my downtown office. My micro-spikes crunched on the glare ice of the river path before I veered up the mountain on the Hellgate Trail. Conditions on the snow-covered singletrack were hellish — rock-hard postholes covered in a couple inches of new powder that made it impossible to gauge foot placement. Running was an ankle-twisting, knee-wrenching exercise in futility. Even walking was technical to the point of frustration. Bill caught up to me near the saddle. We agreed to continue to the peak of Mount Sentinel and drop down the ridge. “Can’t be worse than this,” I reasoned. Nearly all the snow had blown clean off the face of Mount Sentinel, leaving only a base of jumbled rocks protruding from glare ice. 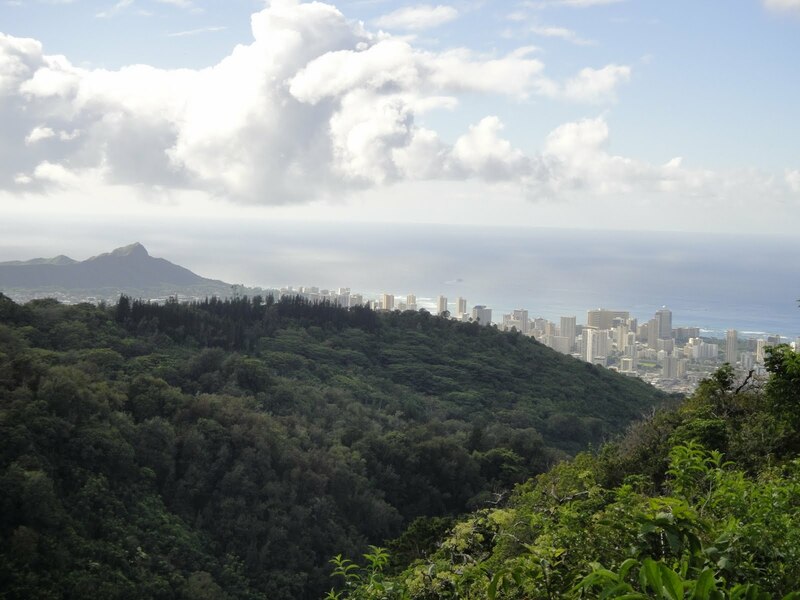 On the front side, where the mountain plunges steeply and directly into the city, there are no trees to shield against the heinous Hellgate winds. Strong gales pushed at our backs, carrying a deep and bitter chill despite “warm” temperatures in the teens. But the larger concern was keeping our balance on the unbelievably slick surface, where even micro-spikes slipped out on the iced rocks. We joked about needing an ice ax and crampons on the same mountain that college students hike up in their Crocs in the summer. We felt like mountaineers. Conditions only worsened as we picked our way down the steep face. The switchbacking “M” trail managed to catch a bulk of the drifted snow, forcing us to either wade through thigh-deep drifts or skitter along the razor-thin edge of the ice-coated trail. 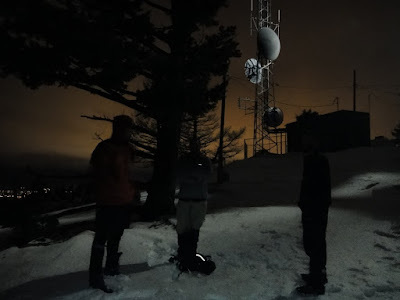 Finally we abandoned the trail and dropped straight down the face, taking careful steps on an ice sheen that threatened to send us careening toward University Avenue, several hundred feet directly below, if we slipped. About 100 vertical feet above the road, two patrol cars with flashing lights stopped in the middle of the street directly below us. Three officers stepped out, shined their lights toward us, and shouted things we could not hear in the roaring wind. “Maybe we’re in trouble because we’re off trail,” I speculated. But the whole scene was confusing. We pointed that we were going to make our way over to the main trailhead. The officers got back in their car and drove there to meet us. “Do you have a vehicle nearby?” the officer asked. “Do you need a ride?” The wicked wind whipped up a veritable ground blizzard in the deserted parking lot. The scene looked dire but I couldn’t help but laugh because the danger had been minimal at best. Bill and I started running again and guffawed about the headlamp “SOS” and the grave concern on the faces of our would-be rescuers. We later learned that the information had gone out on the police scanner, the local newspaper took notice, and there was quite a hubbub about two people trapped in a storm on Mount Sentinel. Who says you can’t have adventures on weeknights? It was the kind of weekend that just kept getting better. After the 50K race we went out for a celebratory sushi dinner, at this nondescript yet fantastic Japanese place in Mountain View. I'm not a foodie and more often than not feel bewildered about why people make such a big deal out of particular types of food (meanwhile, I just like food ... lots of it ... preferably sugar.) But every so often I eat a meal that truly blows me away, and this was one of them. The kind of beautifully rendered, perfectly nuanced, savory and satisfying meal that you take pictures of, so you can post them on Facebook, so all your friends can wonder what the big deal is anyway. Then, on Sunday, I woke up and I wasn't sore. I really wasn't. A little stiff in the calves maybe, but no blisters, no shredded quads, nothing. Six hours on my feet — like some of my medium-length hikes in Juneau — used to take a lot more out of me, at a lower level of overall effort. So I took it as a good sign that I am improving my running fitness. Beat and I enjoyed a lazy morning with several cups of cappuccino, complete with latte art, then made our way over to the coast to go hiking. 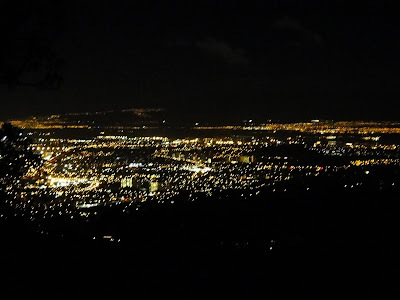 The more time I spend in the Bay area, the more I realize how beautiful and varied it is despite the urbanization (and although I also don't consider myself a "city person," I admit that San Francisco is quite beautiful and varied as an urban setting, as well.) 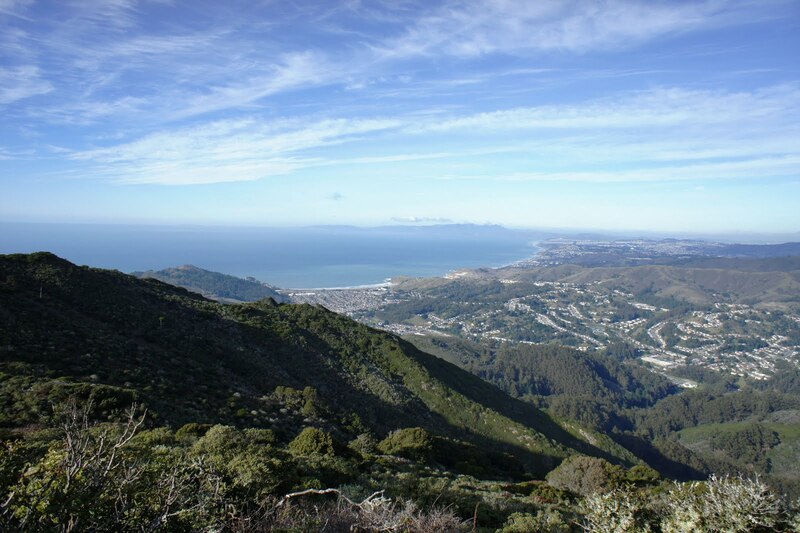 Pacifica is nestled against the Pacific Ocean and the northern ridge of the Santa Cruz Mountains. It's within 10 miles of the heart of San Francisco, but wending through the towns small streets, you'd never suspect that. We climbed into the hills toward a mountain called North Peak. From the summit, we could see the city skyline and the Golden Gate Bridge. But to the east, a rolling topography of green mountains all but hid the massive human footprint of the East Bay. To the west, there was only an expanse of blue water sparkling in the sunlight. From the peak we decided to make our way over to an adjacent peak, which — gasp — had no developed trail en route. We followed the faint footprint of an old jeep road, trudged up a loose rocky slope and had to bushwhack the last hundred yards or so. "Who says you can't find adventure in California," Beat proclaimed as we fought all manner of thorny bushes and jagged rocks, and probably brushed up against poison oak, too. A stiff wind blew along the ridgeline, with windchill that dropped the 40-degree air to something that felt decidedly below freezing. Nine miles and three hours worth of sunshine later, we returned for more tasty dinner (Japanese noodle soup) and a session in the sauna that was more exhausting than the race, but did clear up the last of my racing/hiking soreness. The only flaw in the entire weekend was the plane ride home, complete with the usual air travel headaches. This always-on-the-go lifestyle and relationship has been hard on both of us, but it's more than worth it.